Papyrus codex containing Deuteronomy 1:1-10:7 in Coptic (Sahidic). 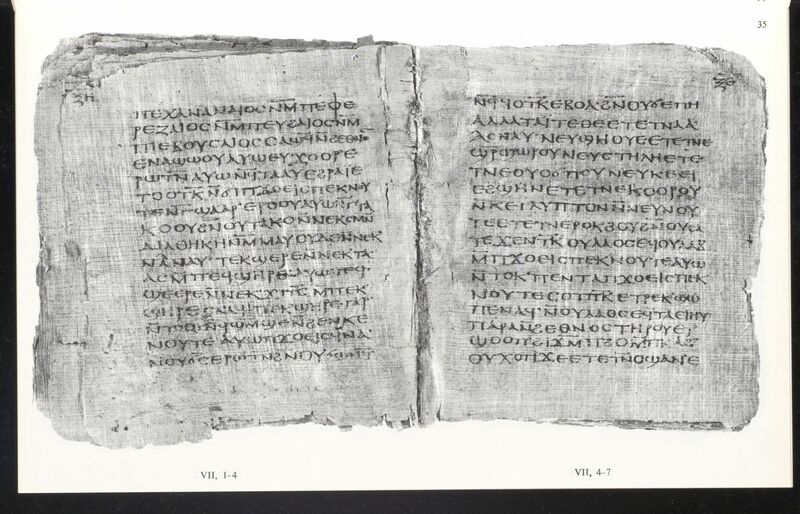 P.Bodmer 18 is a well-preserved papyrus codex containing a portion of Deuteronomy in Sahidic. CopistesP.Bodmer 18 was copied by a single scribe in a Biblical Majuscule with letters of uniform character. Orsini uses this manuscript as an example of the first phase of Biblical Majuscule writing in Coptic (Orsini, “La Maiuscola,” 130; Orsini, “I papiri Bodmer,” 77). Dimensions: The width of the page is 14.0 cm. The height of the page is 15.0 cm. The ratio of the page (width/height) is 0.933. The writing is in a single column. The width of the written area is about 9.5 cm. The height of the written area is about 10.0 cm. There are 17 lines per page There are 48 extant folia. Quires: P.Bodmer 18 is composed of six quaternions. The four central quires are almost entirely intact. The last two leaves of the sixth quire are almost entirely lost. The papyrus is placed in the classic manner →↓,↓→,→↓, so that the start, the middle, and the end of each quire is always horizontal. The quires are numbered on the first page on the right corner. Due to the loss of parts of the edges of the leaves, quires 1 and 3 do not have quire numbers visible, but the rest do. 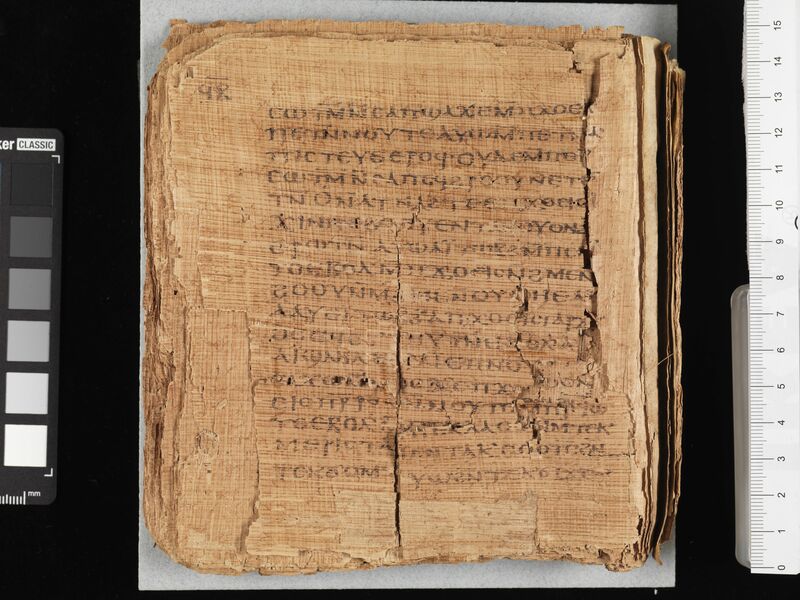 Cover: The cover, which is now missing except near the spine, was composed of two thin quires of four sheets of papyrus glued together. The front and back cover were then stitched together at the spine and reinforced with a band of parchment, which resulted in the present concave appearance of the spine of P.Bodmer 18. Binding: The quires were bound using a link-stitch at three sewing stations, with a thread less than a millimeter thick (Kasser, Papyrus Bodmer XVIII, 8). 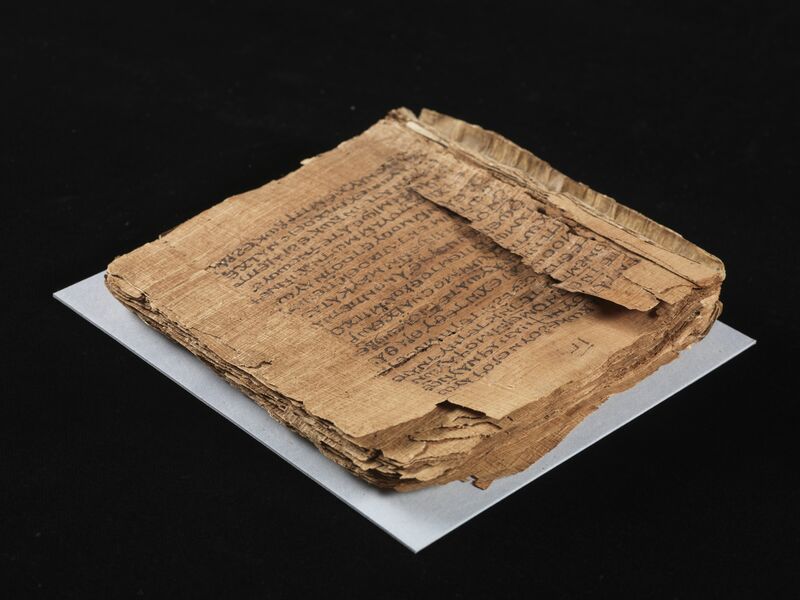 Paratextual features: The beginning of the codex has the title ⲡⲇⲉⲩⲧⲉⲣⲟⲛⲟⲙⲓⲟⲛ ⲙⲙⲱⲩⲥⲏ[ⲥ]. Divisions in the text are not regularly marked using diverse methods, including the forked paragraphos, slightly larger than normal letters, or spaces in the text (Kasser, Papyrus Bodmer XVIII, 11). Corrections in the upper margin are marked with an obelus. Decorations: The opening title is surrounded by a combination of forked paragraphoi and diples. RésuméPapyrus codex containing Deuteronomy 1:1-10:7 in Coptic (Sahidic). Kasser, Rodolphe. 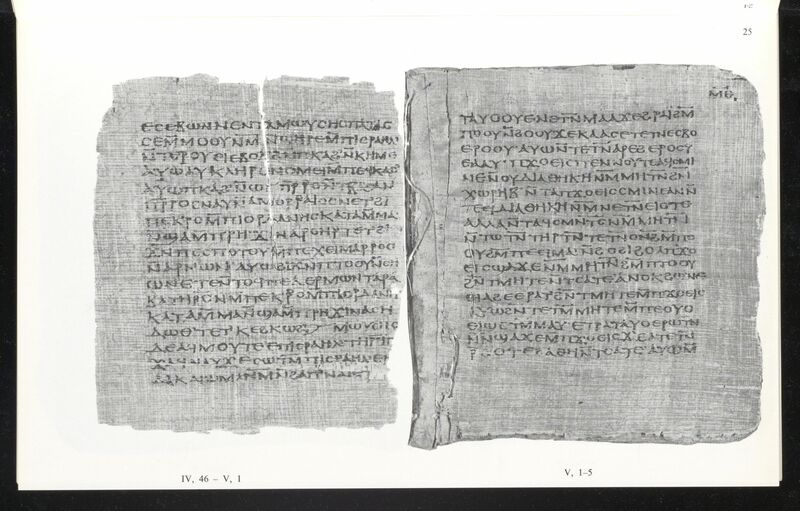 Papyrus Bodmer XVIII: Deuteronome I-X,7 en sahidique. Cologny-Geneva: Bibliotheca Bodmeriana, 1962. Schüssler, Karlheinz. Biblia Coptica.Die koptischen Bibeltexte. Das sahidische Alte und Neue Testament, sa 1-20. Wiesbaden: Harrassowitz, 1995.